Did you recently upgrade your Mac to OS X version 10.10.3 and find that iPhoto stopped working? Have you tried Apple’s new Photos application and decided that you didn’t like it? If so, you can revert to using iPhoto if, before you installed OS X 10.10.3, you had been running iPhoto version 9.6 and a previous version of OS X Yosemite (aka version 10.10.x). In June 2014, Apple announced that they would replace both iPhoto and Aperture with a new application named Photos. Thus, Photos is the future. I encourage you to embrace it. If you want to get familiar with Photos I recommend TidBits’ Photos for Mac: A Take Control Crash Course. Photos works similarly to the Photos application found on iPhones and iPads. Photos has been well reviewed, but it doesn’t have all of the features that iPhoto had. However, if you rely on an iPhoto feature that is missing from Photos, you can try to revert to iPhoto. If you do revert, bear in mind that you’re only buying yourself a bit of time. iPhoto is no longer being updated, so it’s only a matter of time before it becomes incompatible with some future version of OS X. We don’t know if that’ll be in a few weeks or months or years. Important: In order to revert to iPhoto you need to have had both iPhoto version 9.6 and OS X Yosemite (aka OS X version 10.10) installed before you installed the 10.10.3 update. Go to your Applications folder and drag iPhoto 9.6 to the Trash. Click on the Apple menu and select App Store. Once the App Store opens, click the Purchases button that appears at the top of the window in the middle. You’ll see iPhoto listed amongst all of your purchases. Click the Install button that appears to the right of iPhoto. Wait for iPhoto to be downloaded and installed. 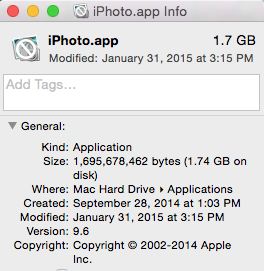 The App Store is downloading iPhoto version 9.6.1 which will work with OS X Yosemite version 10.10.3. Click the Open iPhoto button. Voila. You’re using iPhoto again. Read more about 10.10.3, iphoto, mac, Photos, revert, yosemite.